In response to the wishes expressed by a number of its members and by its General Committee, the FCI has begun a rejuvenation and modernisation programme for its working procedures. The word ‘modernisation’ immediately brings to mind the availability of on-line facilities. Our members (national canine organisations) are currently able to submit applications to hold international shows with CACIB using a tool and form online. They can also consult any financial document via the same platform. However, although the FCI exists because of and for the benefit of its members, it cannot remain indifferent to the interests and concerns of breeders and exhibitors. It is with this in mind that on 31 March of this year, a new data consultation tool was made available on line. 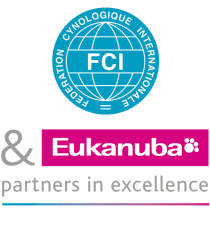 Its purpose is for all canine organisations belonging to the FCI, exhibitors, breeders and anyone else associated with our Federation to be able to consult the results of international shows with CACIB. To this end, we invite all Internet users to visit http://www.fci.be/resultats/IB.aspx and try out this new feature. Ergonomics, concern for the environment, speed, flexibility, time-saving and consideration of the interests of our partners are the criteria which have inspired us to provide you with this new function. The canine world is connected … let’s stay connected with it!